WOW!!! Installed mine this afternoon and what a big difference in the feel of the Versys! Seems like a bigger motorcycle now! If you have an inseam of 32 or more, you owe it to yourself to take some pressure off the knees and buy a set! I also bought the GPS bracket, which is also great. Thanks Speedy! The Motowerks Footpeg Lowering Kit and The Motowerks Mirror extenders were the fist Mods i did to my bike.Bought the bike early January wouldn't ride it till the mirror extenders came in. With the stock mirrors all i could see were my shoulders. Received my foot peg lowering kit and mirror extenders today. Just finished installing them. I have not adjusted the brake or shifter until I test ride it tomorrow. Installation was a breeze. Update #1: I test rode today and it's nice to see a better view of what's behind you. I did adjust the shifter down a little more then 1/2 inch in order to comfortably be able to up-shift. The brake feels odd and alittle too high but will ride some more before I adjust it. Glad I bought these two Speedy accessories. Last edited by surferbum; 04-03-2010 at 11:06 PM. Wish I could conform what Peg I got here with the motowerk, Contractor. It's 4 by 2 inch size and the foot rest well on it. I'll glimpse the Vulcan 750 could be an alternative peg. Yet to confirm though. Those are comfy looking pegs! you don't know where they are from? Do they fit the versys with the lowering blocks? Just ordered my blocks. Several items i'd like to order over time including the footsie and the gps mount! When does the Speedy seat fix kit come out? Got it from a chop shop. 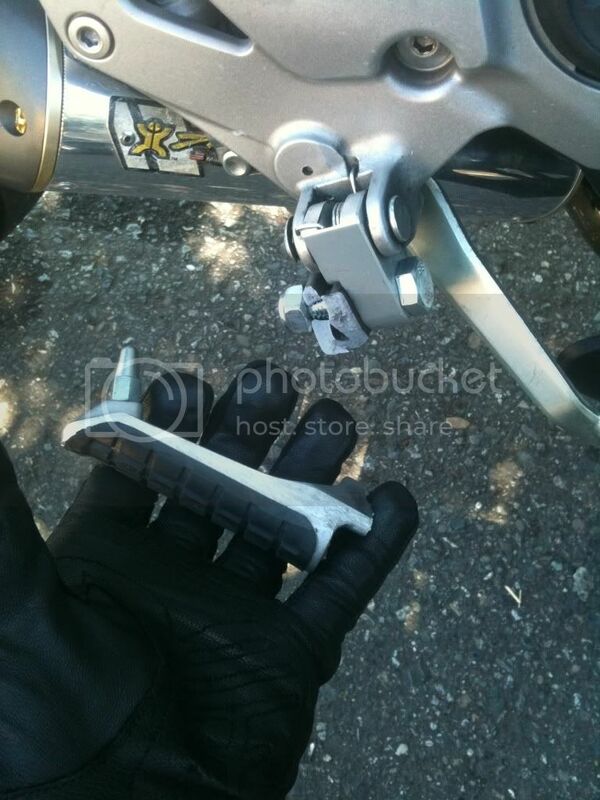 Guy said its from a Suzuki Intruder LC 250.
i bet alot of footpegs fit. footpeg mount are often pretty standard. Last edited by drevil; 07-15-2010 at 08:28 AM. did anybody use the L-bracket for Clearance with the Standard Flatfoot from Speedy? Be sure you don't tighten them too much. After two thousand miles, this happened the other day. I now have a Yamaha dirt bike peg there. Ha ha. I'll be ordering pegs this week and will slap the blocks back on! +3. I have broke 2 pegs so far. 1 standing on peg getting on bike getting in garage. The other standing on peg stretching legs @ 60 miles/hr on highway. DO NOT OVER TIGHTEN, and exercise extreme caution when using these. According to the instructions, the pegs should be installed in the blocks using 25 Nm (18 ft-lbs) of torque. Were your pegs installed to that specification? If so, what torque value would you recommend? Instructions.... a novel idea my friend. I only tightened them snuggly... I think honestly that my horse-style mounting, the cheap cast pegs and also my 240 pounds of bulk all contributed. I loosened the bolt on the Yamaha peg this morning, just to be sure I don't fracture the whole mount piece. I think I'll use some washers inside the new peg to add some strength for future. All Stealerships are sold out locally! 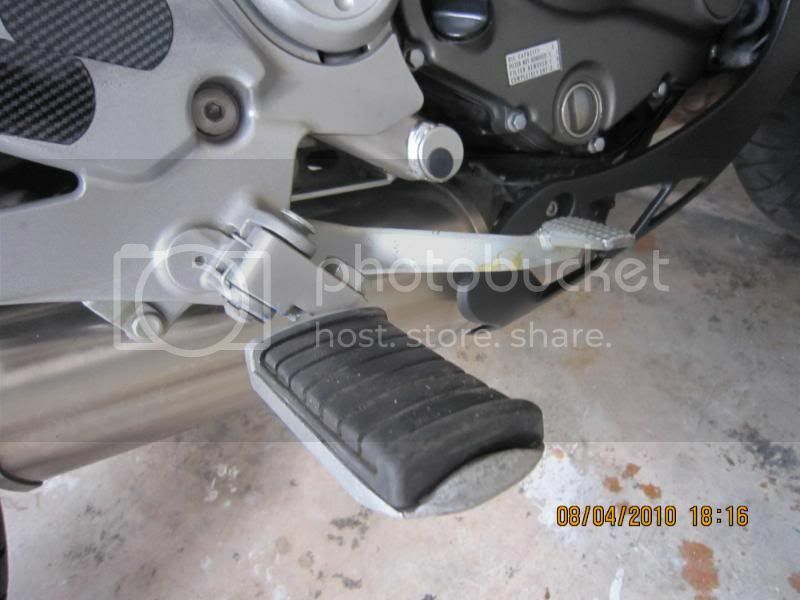 I did not have to use the L-bracket when installing the standard flatfoot on my 2008 Versys. I did squirt some clear silicone between the top edges of the kickstand and the bottom edges of the top clamp. I had some rattle there; the silicone fixed it and it still is able to articulate side to side for unleveled surfaces. There is never a shortage of new areas to see and explore. How many lifetimes could one spend exploring every road that's worth exploring? One of the great pleasures of my road trips is in the discovery of great places to drive or ride (sometimes by planning...sometimes by serendipity). 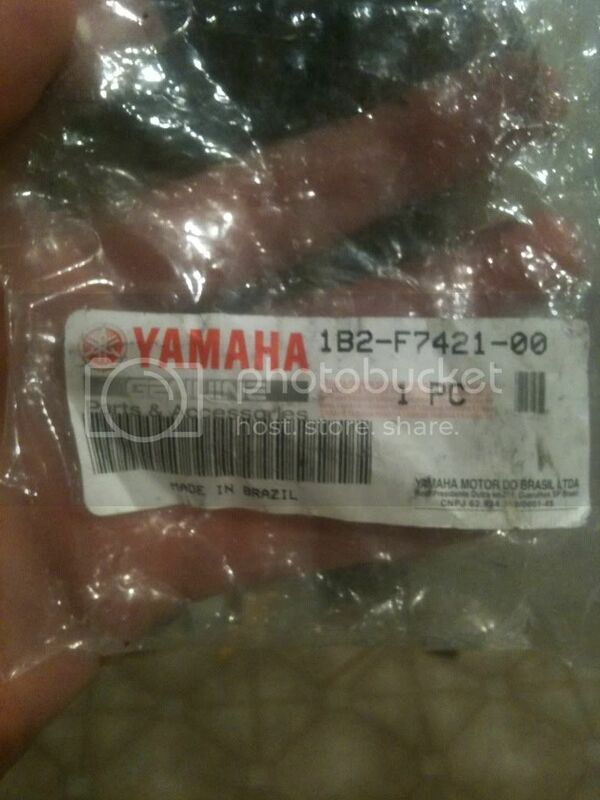 tell us what year and model Yamaha those claw foot pegs were for that are shown in your images. Thanks. 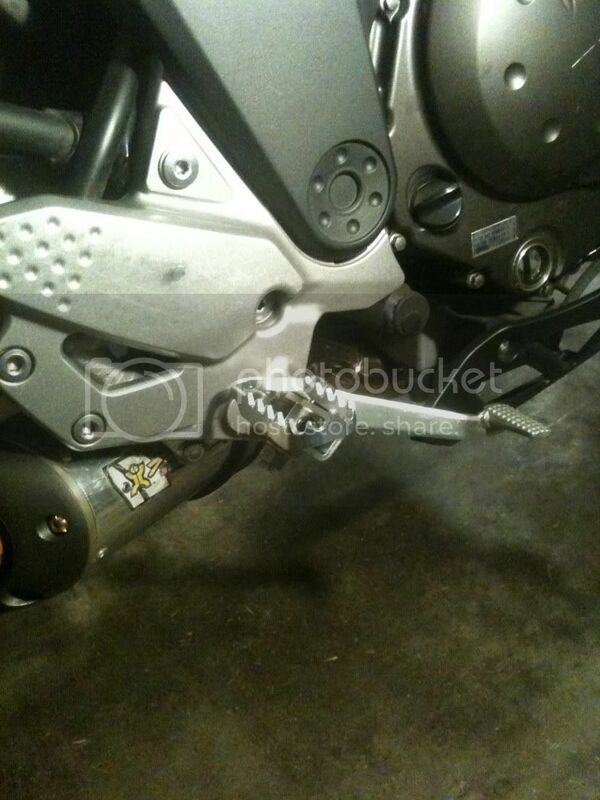 I sent an email to motowerk and they said to measure the distance between kickstand and swing arm. If the distance in smaller than 19mm you should buy the l-bracket; if not, is not necessary. The peg is off a number of models and I got it for a deal, at ten bucks, because it was obsolete. The fisch says its like 26 bucks, but you WILL have to dremel or file a very small amount off one side for it to fit. My lowering blocks, mirror extenders, and handlebar riser arrived safe and sound the other day. Had to look for your on line instructions for the lowering blocks, but once I looked at the excellent pics for 5 min. I went out and had them installed in about the same amount of time.EXCELLENT! Now just that minor adjustment on the shift lever and I'm good to go(EDIT; DONE)....I didn't over tighten foot peg connector bolt! NICE STUFF SPEEDY....no farkling here, just 3 necessary add-ons! Last edited by Grandpa Ron; 09-30-2010 at 09:21 PM. I just got a set of these lowering blocks and was concerned about how the peg bolts to them. I am 260 and stand on the pegs often to traverse sand.....now I don't know if I should trust these things. Did it really break from over tightening or because the mount puts a cantilevered/twisting force into the peg? Has anyone else broke a peg off like this?